As we have heard from the many songs about the subject, love has a peculiar effect on those suffering from it. One could be up to one’s knees in the mud of a distant swamp and, as long as the approaching crocodiles are seen as reflections in the eyes of a loved one, feel that one has arrived in heaven itself. I looked over my magazine at my travelling companion, Lady Charlotte, with whom I am certainly not in love (much as I enjoy her company), and wondered if Paris would be a ghastly disappointment, if perhaps the impression of Paris as a magical and enchanting destination might have sprung from the passion-fuelled, hyperbolic rambling of itinerant lovers. However, we were off to a good start and our transport had exceeded our expectations. Aboard a Eurostar train, we were seated opposite one another in the spacious seats of the Standard Premier class carriage, already enjoying a chilled glass of wine and, streaming through the window, the first rays of sunshine to touch our faces in months. The best thing about these seats is the fact that there are no immediate neighbours – on one side there is the window and on the other there is the aisle. 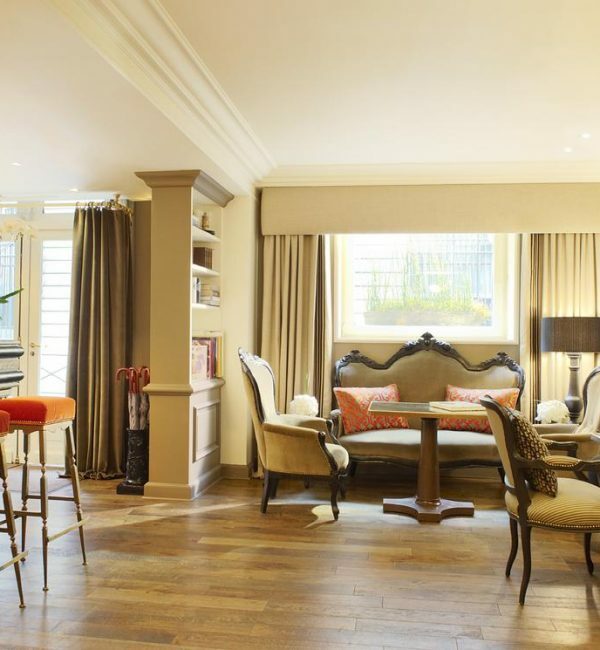 The space and privacy that this afforded made it ideal for a quick business meeting to discuss our publishing schedule, a complimentary light lunch and a moment to wonder whether the correct decision had been made in leaving that pair of shoes at home. Departing from London St Pancras International, we arrived at Paris’ Gare du Nord within two and a half hours, finding the border control process on both sides to be very fast and efficient. After miserable weather in London, it was a joy to emerge into a balmy late afternoon and see Baron Hausmann’s grand architecture with soft sunlight striping across its upper storeys. 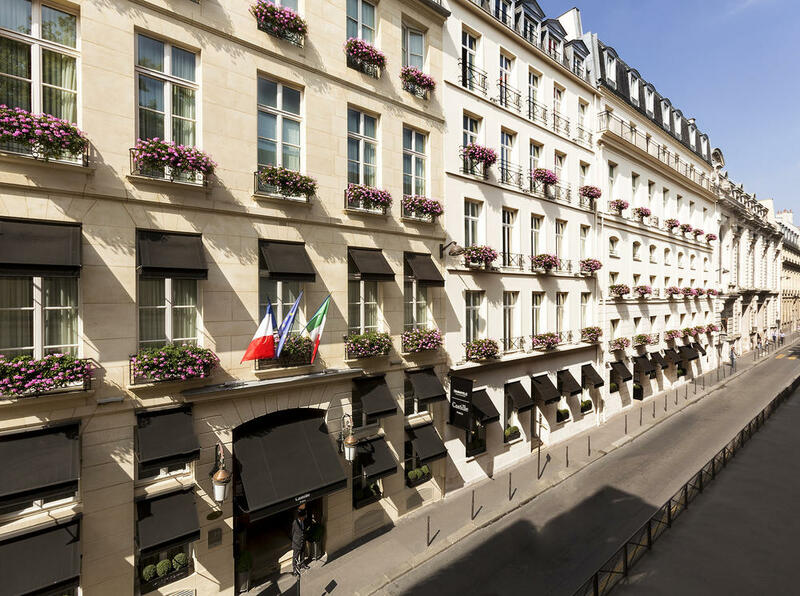 Le Castille Paris is ideally positioned in the heart of the 1st Arrondissement, with many luxury boutiques lining the nearby streets and within easy reach of all the major sights. 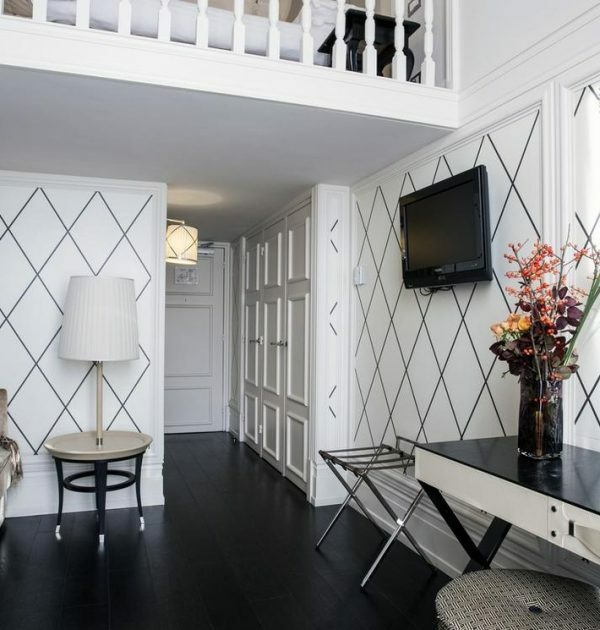 The hotel recently acquired its fifth star after a renovation of the property, inspired by the neighbouring atelier of Coco Chanel; some of the suites in the Rivoli wing take their decor from classic Chanel monochrome prints. 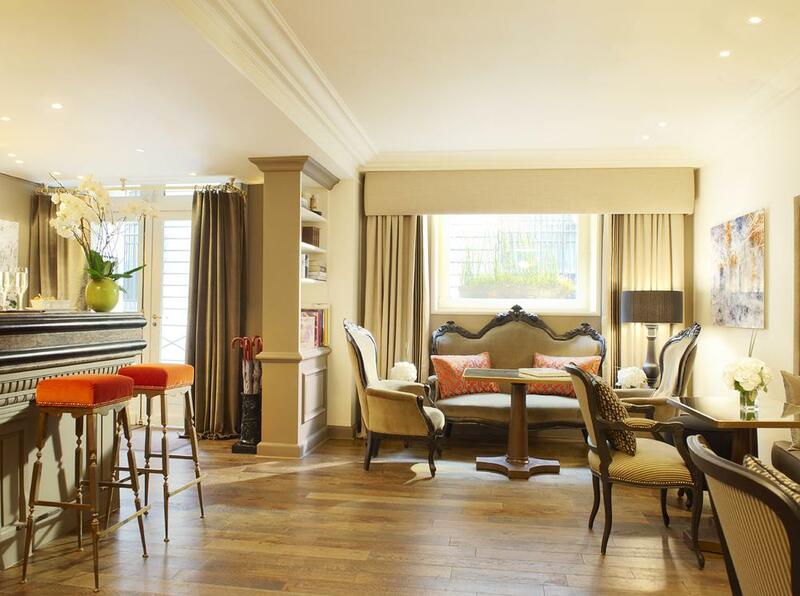 As a boutique hotel, Le Castille has a great deal of both bold character and classic style, not least in the glamorous black and gold dining area and the reception awash with teal. 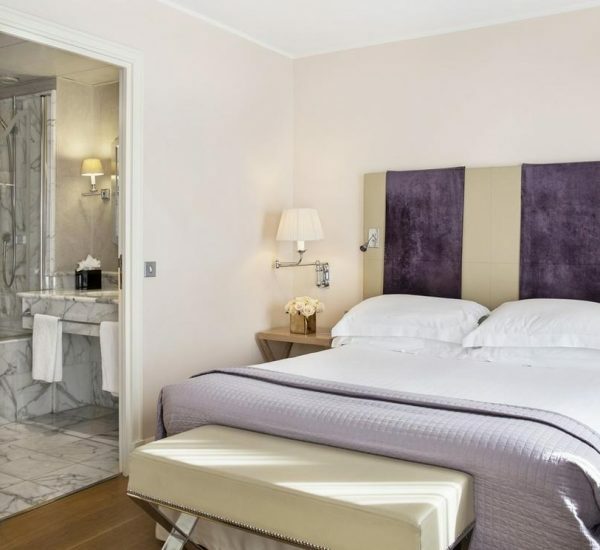 The influence of the aesthetically-minded Italian owners, Starhotels, can be seen in the hotel’s other design features, with striking pieces of art by the entrance and a Florentine-style courtyard that allows guests to completely escape the bustle of Parisian life between its high walls. My room overlooked the courtyard from the hotel’s Opéra wing and, like the opera, the room was opulent and dramatic. The black floor and bright orange accents to the furnishings made the room quite masculine but I quite liked the fuss-free, modern decor. 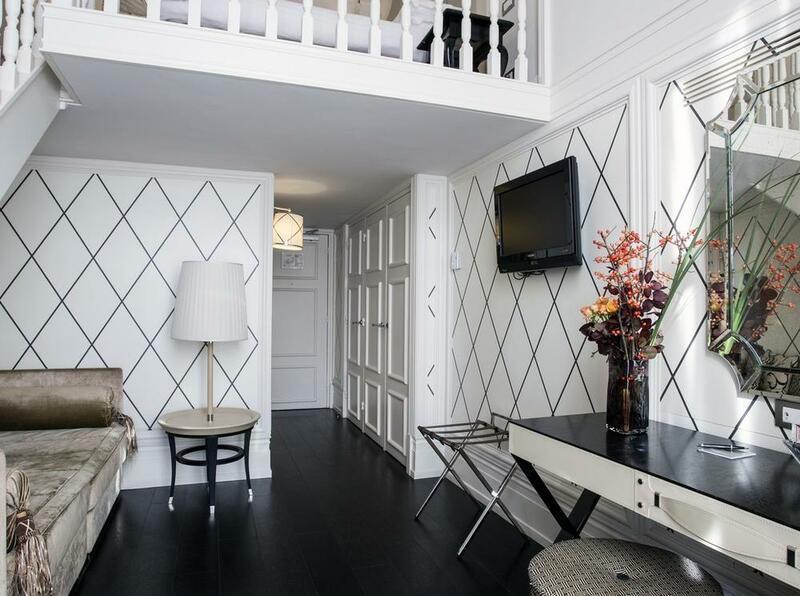 Other styles of room, including elegant contemporary and stunning Chanel inspired duplex suites, are available. When Charlotte and I reconvened for a drink, it was a shame that we couldn’t linger longer and experience the vast selection of teas available in the hotel’s Salon du Thé or the fine Italian food at L’Assaggio Restaurant. However, Paris is an alluring mistress and we were no longer able to resist her call. If you are on a tight schedule, it is possible to see most of the iconic sights in a few days. Although not technically a Paris landmark, Charlotte spotted Metodo Rossano Ferretti, also in Rue Cambon, the very second we stepped onto the street but I managed to steer her away and we headed in the direction of Restaurant Georges at the Centre Pompidou. Of course, the Eiffel Tower is top of the tourist list, one of very few tall buildings to be an end in itself and not full of offices, a spike on the wide horizon that looks as though the earth is being pierced through from beneath. The presence of the ‘Iron Lady’ can be felt wherever you are, all day long, as she looms over the city centre but, after dark, the hourly shimmering light display demands that you make visual contact at least once. One of the best places from which to see this is the opposite bank of the Seine, where you can see the spectacle without craning your neck but the Tower’s size is still impressive. It is also a wonderful end to the dinner cruise aboard the Bateaux Parisiens, truly an opportunity to see how the City of Light lives up to its name. The Notre Dame cathedral is also magnificent at night, when its impressive Gothic architecture is lit from beneath by floodlights and the tiny streets and pretty bridges of the Île de la Cité and the Île Saint Louis become particularly enchanting. This is a great place to sit outside a bar and enjoy a little European café culture with a glass of red, good company and an endless stream of passing entertainment. If you are looking for something to pass the daylight hours, there is something to suit every taste. 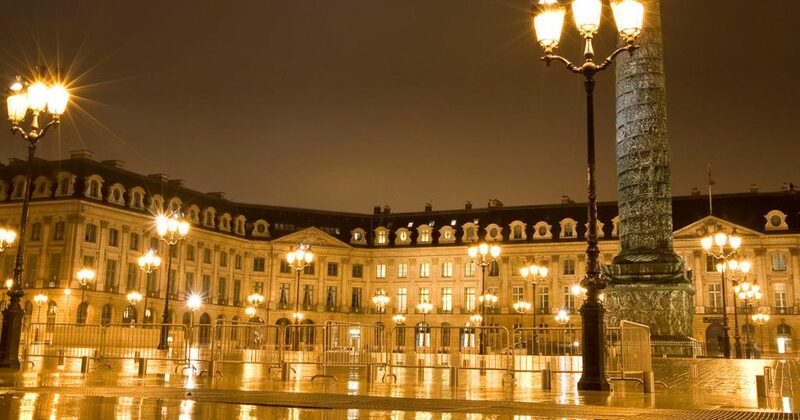 Shoppers can explore the Champs-Elysées, the street on which many of the world’s greatest fashion names have their flagship stores, but there are also many museums and galleries for those who have a yearning for art and culture. Beyond the instantly recognisable glass pyramid at its entrance, the Louvre contains some very famous art works, including the ‘Mona Lisa’, and a wealth of historical treasures. Across the river, the Musée d’Orsay houses the world’s largest collection of impressionist and post-impressionist masterpieces by painters such as Monet, Renoir and Degas. Some of the best views of the city are from the Basilique de Sacré Cœur in Montmartre, although there are quite a few steps to reach the top because it is the highest hill the city. This is a definite draw for tourists, with the area having a bohemian, village feel (and a reputation for being a little seedy at times), so you may have to side-step a few stalls selling undesirable rubbish before you reach somewhere that retains a postcard Parisian flavour, but it is definitely worth a visit. It was a pleasure to return to Le Castille after a long day and indulge in a bath with the luxury, Italian ETRO products. 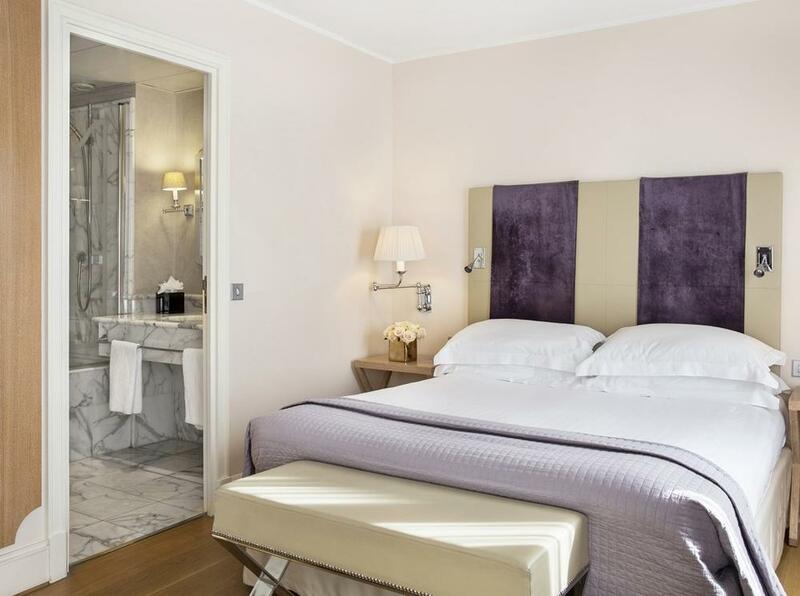 With so much to do and see, Paris would be unlikely to disappoint any visitor and, while it does indeed provide the perfect setting for a romantic break, a visit with friends or family won’t prevent you from seeing a Paris brimming with style and passion. My epiphany came while standing gazing up at the Eiffel Tower at night, when I felt my heartbeat quicken and desire struck me like a surge of water rising from the Seine at my feet. 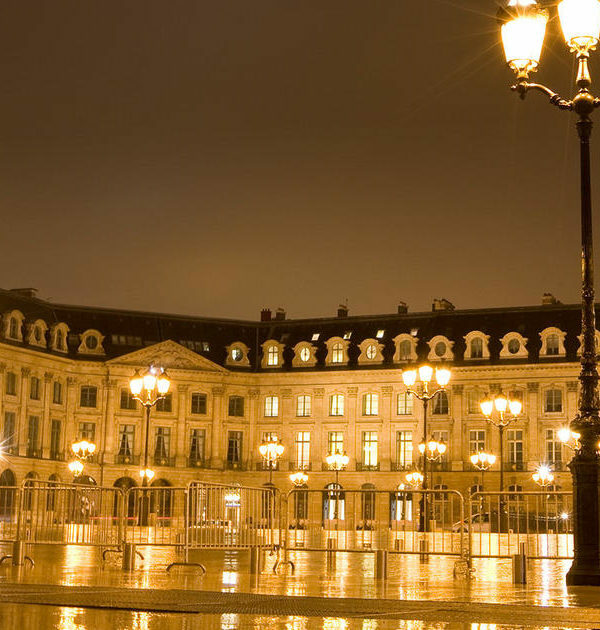 Regardless of who you travel with, everyone finds love in Paris; this beautiful city will steal your heart. Our writers travelled by Eurostar in Standard Premier class from London St Pancras International to Paris Gare du Nord International. This journey takes approximately 2 hours and 20 minutes and a light meal with drink is included with the Standard Premier ticket. In Business Premier class, a full three course meal is served on the journey and passengers have access to dedicated fast track check-in that closes only 10 minutes before departure. There is an on-board bar-buffet from which additional refreshments can be purchased and all Premier passengers can book their seats in one of the two ‘quiet coaches’. For full information about timetables and fares, please visit www.eurostar.com.